Dr. Koppula is a Resident, Division of Nuclear Medicine, and Dr. Rajendran is an Associate Professor of Radiology and Radiation Oncology (Adjunct), Division of Nuclear Medicine, Department of Radiology, University of Washington, Seattle, WA. Ironically, the incidence of head-and-neck cancer remains unchanged, even though it is largely preventable because of its close association with common carcinogens, such as tobacco and alcohol. Its incidence is higher in low socioeconomic groups, and it is prevalent among military veterans, accounting for ≥8% of all new cancers. 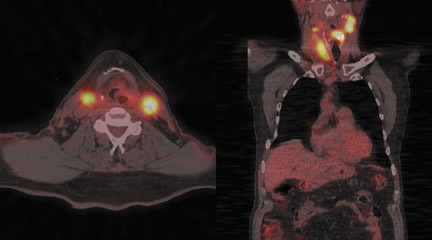 The clinical course of these neoplasms is difficult to predict based on current clinicopathological prognostic criteria.2 Prevalent use of combined positron emission tomography and computed tomography (PET-CT) in the evaluation of locoregional and distant metastatic disease has significantly enhanced capabilities for early detection and staging, providing significant prognostic implications in the management of these patients. Anatomic imaging modalities like CT and magnetic resonance imaging (MRI) are the standard imaging techniques used for the evaluation of a patient with head-and-neck cancer. They provide structural information and rely on certain morphologic criteria like nodal size and contrast-enhancement patterns. However these criteria are not very specific for active disease. For example, the quoted specificities are as low as 39% and 48% for CT and MRI, respectively, for the detection of nodal metastases in patients with head-and-neck cancer with the use of 10 mm as the size criterion for diseased, neck lymph nodes.3 After radical surgery or radiation therapy for head-and-neck malignancies, normal tissue planes are altered substantially and limit the use of these anatomic imaging modalities with further reduction in specificities in assessing residual or recurrent disease.4–7 However, after chemotherapy and/or radiation therapy, changes in tumor metabolism precede morphologic changes, providing an advantage for PET applications. The treatment paradigm for patients with head-and-neck cancers has shifted in the past 2 decades from a primarily surgical approach to a combination of therapies that includes surgery, preoperative or postoperative radiation therapy, and neoadjuvant or induction chemotherapy. Radiotherapy is an important treatment modality, which may be used as an adjunct to surgery for control of nodal disease or it may be used effectively as a primary treatment with or without chemotherapy in a majority of patients with head-and-neck cancer. Concurrent chemotherapy has further improved treatment results but is associated with higher normal-tissue toxicity. While neck irradiation effectively controls microscopic disease, it results in a higher morbidity when the radiation dose is intensified to a larger treatment volume using conventional techniques. Currently, treatment decisions are based on data extrapolated from retrospective institutional series and cannot be applied reliably to treatment planning for individual patients, limiting the ability to tailor the intensity and apply targeted therapy for an individual patient without increasing toxicity. Close proximity of important normal tissues and organs, such as the salivary glands, requires more stringent radiation dosimetry. Biological insights on these cancers obtained by PET-CT will permit selection and targeting to achieve more efficacious and less morbid treatments. The technique of FDG PET is based on the detection of coincident annihilation photons released during decay of FDG, which is a glucose analogue that competes with glucose for the same transport system to enter into metabolically active cells. Malignant cells show increased glycolysis leading to increased glucose utilization resulting from up-regulation of hexokinase activity. However, there is no single explanation for this increased glycolysis in malignant cells. The effect of increased glycolysis in malignant cells was first described by Otto Warburg in 1924 and is known as Warburg effect: it is proportional to their metabolic activity. Tumor cells take up glucose by facilitated transport using glucose transporters (GLUT). It then undergoes glycolysis with formation of pyruvate under aerobic conditions. FDG is initially phosphorylated like glucose, but unlike glucose-6-phosphate, FDG-6-phosphate cannot undergo further metabolism and thus gets trapped and accumulates within metabolically active tumor cells. This accumulation of FDG-6-phosphate within the cell, combined with a higher concentration of neoplastic cells in a tumor, form the basis for the successful use of FDG in PET tumor imaging. Because glucose competes with FDG for uptake into metabolically active cells, it is important to have adequate control of the blood-glucose level to improve the sensitivity of the examination.19 Control of blood-glucose is very important in diabetic patients and care needs to be taken to make sure that the blood-glucose levels are not high (<150 mg). Use of insulin to lower blood-glucose levels prior to FDG scanning is generally not advisable, as it would pump into the muscles, resulting in interpretative difficulties. The most common way of expressing the FDG uptake is the Standardized Uptake Value (SUV), which is the ratio of FDG concentration in a region of interest to its concentration in the whole body. Several factors including body weight, surface area, partial volume effect, injected dose and time after tracer injection affect the calculated SUV values. PET evaluation is limited by poor anatomic detail, and correlation with some other form of imaging, such as CT, is desirable for differentiating normal from abnormal radiotracer uptake. Although the combination of separately acquired CT and PET scans using retrospective or prospective registration methods is more accurate than CT alone, this approach is limited by patient movement and by difficulty in exactly correlating points on CT and PET scans. Bayer et al.20 described the prototype PET-CT scanner used in clinical imaging, in which precisely coregistered functional and anatomic images can be obtained by performing a PET study and a CT study on the same scanner without moving the patient. PET-CT is a unique fusion of the cross-sectional anatomic information provided by CT and the metabolic information provided by PET. This technique of fusion imaging offers the potential for improved detection and localization of head-and-neck cancer with one imaging tool. PET-CT has become an accepted and widely used imaging modality for the staging and follow-up/surveillance of head-and-neck cancer. The PET portion of the PET-CT scan is performed approximately 1 hour after intravenous injection of 6 to 15 mCi of FDG. Helical CT data (pitch 1.1 to 1.6) is immediately acquired preceding acquisition of 3-dimensional emission data (5 to 10 min per bed position, 2 to 5 bed positions per patient). Patient preparation typically includes fasting, control of the blood-sugar level, etc. Necessary measures are taken to reduce FDG uptake in brown fat. If needed, patients are also administered lorazepam. When PET-CT images are used for radiation therapy planning, patients are imaged with the same immobilization devices that would be used during their radiation therapy. The PET scans are corrected for attenuation with coefficients obtained by scaling the CT numbers to the PET energy level (511 kV). The helical CT scans are reconstructed into 512 pixel × 512 pixel images with a section thickness that matches the PET scans (2.4 mm to 3.4 mm). T4: Invading through cortical bone, inferior alveolar nerve, floor of the mouth, or skin of the face. However, PET provides valuable additional information in relation to nodal and distant disease staging. One exception is the use of PET in identifying the primary tumor site in patients who present with cervical lymph node metastatic head-and-neck squamous-cell carcinoma (HNSCC) from a clinically undetectable or unknown primary tumor. MRI is typically the initial imaging study of choice because, compared with PET-CT without contrast material, it is capable of more accurately delineating the extent of tumor and evaluating perineural involvement and intracranial extent of disease. In this manner, MRI is nearly comparable with noncontrast PET-CT in accuracy in detecting regional nodal metastasis. However, PET-CT with contrast material may be a reasonably accurate alternative for delineating the extent of disease at initial presentation. For evaluating metastatic disease in cervical lymph nodes, FDG PET-CT has been previously shown to be comparable to, or superior than, conventional imaging in detecting regional lymph nodal metastases during initial staging.24–26 An average sensitivity of 87% to 90% and a specificity of 80% to 93% were reported for FDG PET-CT;27 compared with a sensitivity of 61% to 97% and a specificity of 21% to 100% for MRI or CT. FDG PET-CT plays an important role in identifying disease in lymph nodes in unexpected locations (upper mediastinum and axillae) and detecting unsuspected distant metastatic disease. PET-CT has an advantage over conventional imaging, in this setting, because of its whole-body coverage and its sensitivity to lesions that may be missed by conventional imaging such as subtle bone metastases that may not be detectable on a routine chest or abdominal CT scan. PET can detect occult distant metastatic disease in as many as 10% of patients with advanced local-regional disease. PET-CT also has another advantage in detecting a synchronous malignancy specifically involving the upper aero-digestive tract, as the risk factors for these malignancies is the same and include tobacco chewing, smoking and alcohol ingestion. Up to 10% of all head-and-neck malignant lesions present with lymph nodal metastases without clear evidence of a primary tumor site (Figure 2). Treatment of this group of patients is a challenge as a large or full extent of the pharyngeal mucosa needs to be irradiated which may harbor the putative primary tumor site. Irradiation of such an extensive area is associated with significant morbidity and possibly for a little gain. Identification of the occult primary site is critical in management as this can be amenable for surgical resection and thus in defining and limiting the extent of radiotherapy. A useful approach to identify the unknown primary site is to obtain a PET-CT, especially in the absence of positive findings on clinical examination, in-office endoscopy and MRI. If a suspect focus is identified on PET-CT, the patient should undergo panendoscopy, during which a frozen-section biopsy of the suspect focus can be obtained. If this is negative, then further biopsy specimens from the most common locations for primary tumors can be obtained. However, if PET-CT does not show a suspect focus for a primary tumor, then the patient can undergo panendoscopy right away to obtain biopsy specimens from the usual and most common sites of primary tumors.29 Thus PET-CT would provide a road map for a targeted biopsy. Accurate spatial delineation of targets is very important with treatment modalities delivering highly conformal 3-dimensional radiation dose distributions, such as intensity-modulated radiation therapy (IMRT) and stereotactic radiosurgery (SRS). Both IMRT and SRS are commonly used treatment modalities for head-and-neck carcinomas. Similarly, PET-CT is also limited by nonspecific uptake of FDG in lymphoid tissues, salivary glands, muscles and soft tissues, resulting from post inflammatory changes. PET-CT has been shown in multiple studies, to be more accurate in identifying and delineating the residual and recurrent tumors.33–37 PET-CT is useful in monitoring the treatment response and for accurately assessing residual disease after surgery, chemoradiation alone or in combination with surgery. Variable FDG uptake in normal structures such as nasal turbinates, pterygoid muscles, salivary glands, extra-ocular muscles, and lymphoid tissues of the adenoids and Waldeyer ring may result in difficulty interpreting the PET-CT scan. This may result in false-positive findings. Similarly, normal uptake of FDG in contracting muscles, as for example in tense/anxious patients or in talkative patients, may also lead to false-positive findings. However, even though overlap between tumor and physiologic uptake may confound interpretation, PET-CT allows direct correlation of FDG uptake with anatomic structures to reduce false-positive results. Inflammatory changes in tissues resulting from prior surgery may result in increased glycolysis and therefore in increased FDG uptake. Tumors with inherently low FDG uptake such as the majority of salivary gland tumors and those tumors with significant necrosis (with lower amounts of metabolically active malignant tissue) can potentially yield false-negative or equivocal results.42–44 The role of FDG PET-CT in these situations will have to be carefully weighed against the benefits to the patient. Developments in system technology and radiopharmaceuticals promise to make PET-CT much more useful and versatile in the future. More efficient PET instrumentation with regards to both electronic design as well as development of newer detector materials promise faster image acquisition and higher spatial resolution. Newer detector materials like Lutetium-yttrium oxyorthosilicate and other recent Lutetium oxyorthosilicate crystals have renewed interest in the time of flight (TOF) reconstruction algorithm, which was described in the 1980s. 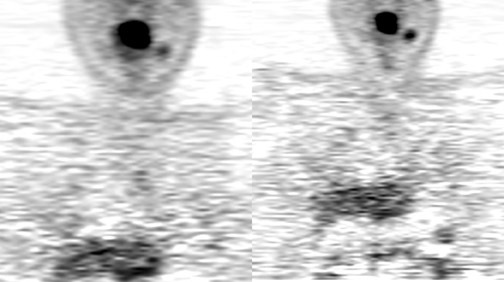 TOF techniques can more accurately localize the origin of the annihilation reaction, leading to higher image quality, reduced image noise, lesser radiotracer dose (and thus a reduced patient dose), and shorter imaging time. This technique is most useful in heavy patients and is generally better at imaging deeper tissues. This technique will play a key role in radiation therapy planning by precisely mapping the tumor tissue and avoiding radiation to the adjacent normal tissue. A number of other radiopharmaceuticals are being investigated and appear very promising for answering specific questions about tumor biology and in selecting and directing appropriate therapy. These include cell proliferation tracers [C-11]-thymidine and [18F]-fluorothymidine; amino acids, such as [C-11]-methionine; membrane synthesis tracers [C-11]-acetate; and hypoxia tracers, such as 18F]-fluoro-misonidazone (FMISO). However, all these tracers are still in the research stage and are not yet approved for clinical use. They hold the promise for successful applications in specific clinical situations. Use of multiple tracers and diagnostic modalities will help personalize cancer therapy for the individual patient, with PET-CT playing a major role in this regard. 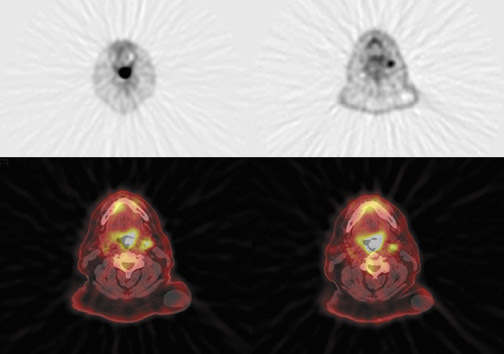 Combined PET-CT imaging optimizes the interpretation of FDG PET findings in head-and-neck cancer. Superior localization of radiotracer uptake with this technique can improve diagnostic accuracy and help avoid interpretative pitfalls. Improved resolution of the scanners in the future will help address the limitation related to lesion size and may make PET-CT more valuable in initial tumor staging and surveillance of recurrence and evaluation of residual tumor. The development of tumor-specific ligands will enhance the usefulness of PET-CT in the detection of early-stage tumors and in the evaluation of tumors with low FDG avidity. Successful treatment outcome for patients with head-and-neck cancer will be more likely thanks to better predictive abilities, as well as better differentiation of tumor from radiation reaction and/or scar, and by improved abilities to precisely localize the tumor. In the future, treatment targeting may be more effective with the addition of information from biomarkers rather than based solely on morphologic data that will play a major role in personalizing cancer therapy. Pinto HA, Jacobs C. Chemotherapy for recurrent and metastatic head and neck cancer. Hematol Oncol Clin North Am. 1991;5:667-686. Rajendran JG. Positron emission tomography in head and neck cancer. Applied Radiology. 2003; 32:9-12. Curtin H, Ishwararn H, Mancuso H, et al. Comparison of CT and MRI imaging in staging of neck metastases. Radiology. 1998;207:123-130. Greven KM, Williams DW, 3rd, Keyes JW, Jr, et al. Positron emission tomography of patients with head and neck carcinoma before and after high dose irradiation. Cancer. 1994;74:1193-1195. Ojiri H, Mendenhall WM, Mancuso AA. CT findings at the primary site of oropharyngeal squamous cell carcinoma within 6–8 weeks after definitive radiotherapy as predictors of primary site control. Int J Radiat Oncol Biol Phys. 2002;52: 748-754. Kao CH, ChangLai SP, Chieng PU, Yen RF, Yen TC. Detection of recurrent or persistent nasopharyngeal carcinomas after radiotherapy with 18-fluoro-2-deoxyglucosepositron emission tomography and comparison with computed tomography. J Clin Oncol. 1998;16:3550-3555. Anzai Y, Carroll WR, Quint DJ, et al. Recurrence of head and neck cancer after surgery or irradiation: Prospective comparison of 2-deoxy-2-[F-18] fluoro-D-glucose PET andMR imaging diagnoses. Radiology. 1996;200:135-141. Haberkorn U, Strauss LG, Dimitrakopoulou A, et al. Fluorodeoxyglucose imaging of advanced head and neck cancer after chemotherapy. J Nucl Med. 1993;34:12-17. Brun E, Kjellén E, Tennvall J, et al. FDG PET studies during treatment: Prediction of therapy outcome in head and neck squamous cell carcinoma. Head Neck. 2002;24:127-135. Adams S, Baum RP, Stuckensen T, Bitter K, Hör G. Prospective comparison of 18F-FDG PET with conventional imaging modalities (CT, MRI, US) in lymph node stagingof head and neck cancer. Eur J Nucl Med. 1998;25:1255-1260. Stokkel MP, ten Broek FW, Hordijk GJ, Koole R, van Rijk PP. Preoperative evaluation of patients with primary head and neck cancer using dual-head 18fluorodeoxyglucosepositron emission tomography. Ann Surg. 2000;231:229-234. Hannah A, Scott AM, Tochon-Danguy H, et al. Evaluation of 18 F-fluorodeoxyglucose positron emission tomography and computed tomography with histopathologic correlation in the initial staging of head and neck cancer. Ann Surg. 2002;236: 208-217. Lowe VJ, Dunphy FR, Varvares M, et al. Evaluation of chemotherapy response in patients with advanced head and neck cancer using [F-18] fluorodeoxyglucose positronemission tomography. Head Neck. 1997;19:666-674. Lapela M, Eigtved A, Jyrkkiö S, et al. Experience in qualitative and quantitative FDG PET in follow-up of patients with suspected recurrence from head and neck cancer.Eur J Cancer. 2000;36:858-867. Wong RJ, Lin DT, Schöder H, et al. Diagnostic and prognostic value of [(18)F] fluorodeoxyglucose positron emission tomography for recurrent head and neck squamous cell carcinoma. J Clin Oncol. 2002;20:4199-4208. Lowe VJ, Boyd JH, Dunphy FR, et al. Surveillance for recurrent head and neck cancer using positron emission tomography. J Clin Oncol. 2000; 18:651-658. Terhaard CH, Bongers V, van Rijk PP, Hordijk GJ. F-18-fluoro-deoxy-glucose positron-emission tomography scanning in detection of local recurrence after radiotherapy forlaryngeal/pharyngeal cancer. Head Neck. 2001;23:933-941. Smith TA. FDG uptake, tumor characteristics and response to therapy: A review.Nucl Med Commun. 1998;19:97-105. Kapoor V, McCook BM, Torok FS. An Introduction to PET-CT Imaging. Radiographics. 2004;24: 523-543. Beyer T,Townsend DW, Brun T, et al. A combined PET-CT scanner for clinical oncology.J Nucl Med. 2000;41:1369-1379. McGuirt WF, Greven K, Williams D 3rd, et al. PET scanning in head and neck oncology: A review. Head Neck. 1998;20:208-215. Laubenbacher C, Saumweber D, Wagner-Manslau C, et al. Comparison of fluorine-18-fluorodeoxyglucose PET, MRI and endoscopy for staging head and neck squamous-cell carcinomas. J Nucl Med. 1995;36:1747-1757. Wong WL, Chevretton EB, McGurk M, et al. A pro-spective study of PET-FDG imaging for the assessment of head and neck squamous cell carcinoma. Clin Otolaryngol Allied Sci. 1997;22: 209-214. Schmid DT, Stoeckli SJ, Bandhauer F, et al. Impact of positron emission tomography on the initial staging and therapy in locoregional advanced squamous cell carcinomaof the head and neck. Laryngoscope. 2003;113:888-891. Di Martino E, Nowak B, Hassan HA, et al. Diagnosis and staging of head and neck cancer: A comparison of modern imaging modalities (positron emission tomography, computed tomography, color-coded duplex sonography) with panendoscopic and histophathologic findings. Arch Otolaryngol Head Neck Surg. 2000:126: 1457-1461. Schwartz DL, Rajendran J, Yueh B, et al. Staging of head and neck squamous cell cancer with extended-field FDG-PET. Arch Otolaryngol Head Neck Surg. 2003:129:1173-1178. Schöder H, Yeung HW. 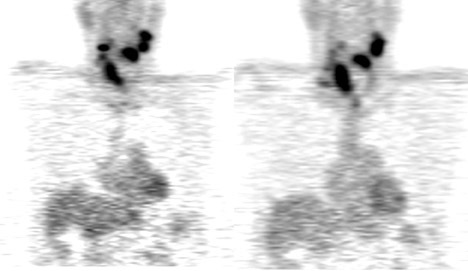 Positron emission imaging of head and neck cancer, including thyroid carcinoma. Semin Nucl Med. 2004;34:180-197. Menda Y, Graham MM. Update of F18-fluorodeoxygluccose/positron emission tomography and positron emission tomography/computed tomography imaging of squamoushead and neck cancers. Semin Nucl Med. 2005;35:214-219. Quon A, Fischbein NJ, McDougall IR, et al. Clinical role of F18-FDG PET-CT in the management of squamous cell carcinoma of the head and neck and thyroid carcinoma.J Nucl Med. 2007; 48 (Suppl 1):58S-67S. Ciernik IF, Dizendorf E, Baumert BG, et al. Radiation treatment planning with an integrated positron emission and computer tomography (PET-CT): A feasibility study. Int J Radiat Oncol Biol Phys. 2003:57:853-863. Heron DE, Andrade RS, Flickinger J, et al. Hybrid PET-CT simulation for radiation treatment planning in head-and-neck cancers: A brief technical report. Int J Radiat Oncol Biol Phys. 2004; 60: 1419-1424. Bronstein AD, Nyberg DA, Schwartz AN, et al. Soft-tissue changes after head and neck radiation: CT findings. AJNR Am J Neuroradiol. 1989;10:171-175. Kitagawa Y, Nishizawa S, Sano K, et al. Prospective comparison of F18-FDG-PET with conventional imaging modalities (MRI, CT and Ga67 scintigraphy) in assessment ofcombined intra-arterial chemotherapy and radiotherapy for head and neck carcinoma. J Nucl Med. 2003; 44: 198-206. Dalsaso TA, Lowe VJ, Dunphy FR, et al. 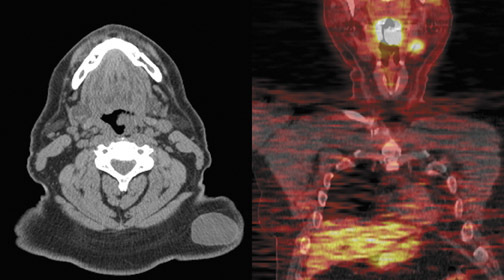 FDG-PET and CT in evaluation of chemotherapy in advanced head and neck cancer. Clin Positron Imaging. 2000:3:1-5. Andrade RS, Heron DE, Degirmenci B, et al. Post treatment assessment of response using FDG-PET-CT for patients treated with definitive radiation therapy for head andneck cancers. Int J Radiat Oncol Biol Phys. 2006;65:1315-1322. Klabbers BM, Lammertsma AA, Slotman BJ. The value of positron emission tomography for monitoring response to radiotherapy in head and neck cancer. Mol Imaging Biol. 2003;5:257-270. Goerres GW, Schmid DT, Bandhauer F, et al. Positron emission tomography in the early follow-up of advanced head and neck cancer. Arch Otolaryngol Head Neck Surg. 2004;130:105-109. Duarte PS, Zhuang H, Castellucci P,Alavi A. The receiver operating characteristic curve for the standard uptake value in a group of patients with bone marrow metastasis.Mol Imaging Biol. 2002;4:157-160. Avril N, Weber W. Monitoring response to treatment in patients utilizing PET. Radiol Clin North Am. 2005;43:189-204. Zhuang H, Yu JQ, Alavi A. Applications of fluorodeoxyglucose-PET imaging in the detection of infection and inflammation and other benign disorders. Radiol Clin North Am. 2005;43:121-134. Rogers J, Greven KM, McGuirt WF, et al. Can post-RT neck dissection be omitted for patients with head-and-neck cancer who have a negative PET scan after definitive radiation therapy? Int J Radiat Oncol Biol Phys. 2004;58:694-697. McGuirt WF, Keyes JW Jr, Greven KM, et al. Preoperative identification of benign versus malignant parotid masses: A comparative study including positron emission tomography. Laryngoscope. 1995;105:579-584. Nowak B, Di Martino E, Jänicke S, et al. Diagnostic evaluation of malignant head and neck cancer by F-18 FDG PET compared to CT/MRI. Nuklearmedizin. 1999;38:312-318. Veeramachaneni R, Gulick J, Halldorsson AO, et al. Benign myoepithelioma of the lung: A case report and review of the literature. Arch Pathol Lab Med. 2001;125:1494-1496. 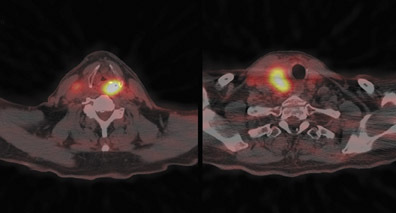 PET-CT in head and neck cancer. Appl Radiol.